So it’s been some 20 years since John Hammond first announced, “we have a T-Rex!”, and you’d be forgiven for assuming that Jurassic Park’s well-worn legacy lived and died with its glorious original outing. Fear not though, as Jurassic World is really rather good. Slow to start, and initially lacking in awe-inspiring moments, it first appears that newbie director Colin Trevorrow has failed to revive an ailing species. Yet there are moments when a pulse of hope flutters within the film. First the Mosasaurus reveal, then the Indominous Rex escape, then the containment unit attack – brief glimpses of entertainment emerge. In all honesty, even the raptor training scene works pretty well. But it all finally bursts to familiar life with THAT scene in the Gyrosphere…and we’re back in business! The more the action builds, logic goes out of the window; (how long do goggle batteries last? and is a dying dinosaur really more important than saving two children?) but ’tis to be expected in a blowout extravaganza such as this. The trade-off is that in return for surrendering sense, we get some awesome set pieces and a slow-mo money shot that could become as iconic as the rippling water in Spielberg’s original. Bryce Dallas Howard and a sombre Chris Pratt are affable enough and help hold the film together; in spite of some relatively base character roles. While on the other end of the spectrum, are two of the least engaging children in the franchise’s history. It’s unusual to see Spielberg (who serves as Executive Producer here) help cast such charmless child actors, but in Ty Simpkins and Nick Robinson they’ve truly scraped the lowest regions of that barrel. Special mention is to be made of Jake Johnson, the everyman who is essentially Jurassic World’s mirth machine. I’d be loathed to spill many more beans, as it remains to say Jurassic World’s spark is in the sum parts of its viewing experience. Watch it now. Frustratingly, Jurassic World gets a very puffy set of special features that essentially tread water and circle similar territory rather than giving any substantial insight into the film. Director Colin Trevorrow and Chris Pratt get the bulk of airtime, which starts with the brisk Chris & Colin Take On The World, and goes from there. The two share an easy chemistry, with Pratt offering some thoughtful words about his experiences on set. Pratt pops up again to lead the way in Innovation Centre Tour With Chris Pratt. This blink and you’ll miss it advertorial offers some neat close ups of the film’s new visitor’s centre and Colonel Sanders-esque John Hammond statue in it’s lobby. 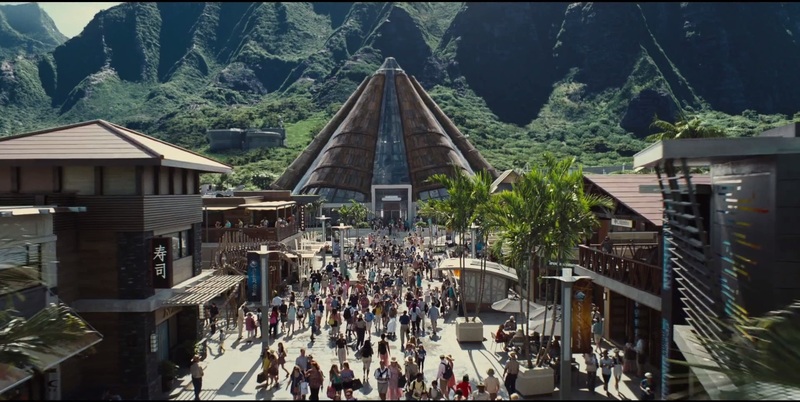 The second feature/advert comes in the form of Jurassic World: All-Access Pass, which is a misleading title, as it’s really just a trickle of talking heads and flybys of scenes from the film. A series of Deleted Scenes offer no additional worth, barring one fun exchange mirroring the infamous dino poop scene from the original Jurassic Park. Whilst Dinosaurs Roam Once Again has some nice yet fleeting up close and personal looks at the practical dinosaurs used during production. The beauty of these models is outstanding, and it is a shame elements such as these get such minimal attention. Welcome To Jurassic World comes closest to what could be described as a ‘documentary’, with its sugary back slapping sycophancy intercut with genuinely interesting looks at the film’s production. 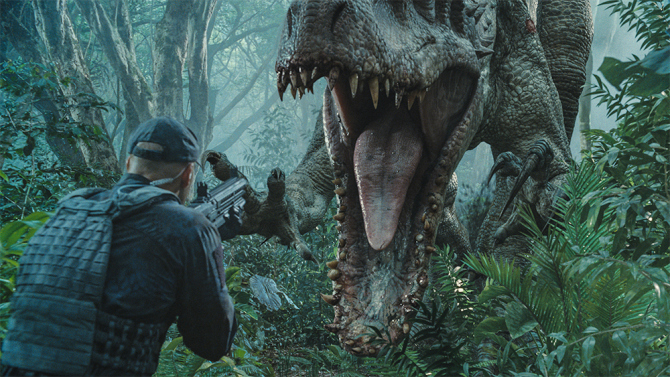 Trevorrow offers coherent and thoughtful soundbites, whilst a steady stream of new and engaging behind-the-scenes clips detail just how overwhelming the undertaking must have been for the young director. And the oft discussed high-heels dilemma is finally answered. How did Bryce Dallas Howard outrun a T-Rex in heels? She didn’t. She wore pumps…the cheat! One nice extra feature is the descriptive audio which offers the visually impaired a chance to experience the film in a more engaging way. Kudos to Universal for that. That being said, when all is said and done you cannot help but wonder; where oh where is a director’s commentary!? Or at the very least, a retrospective of the franchise as a whole. 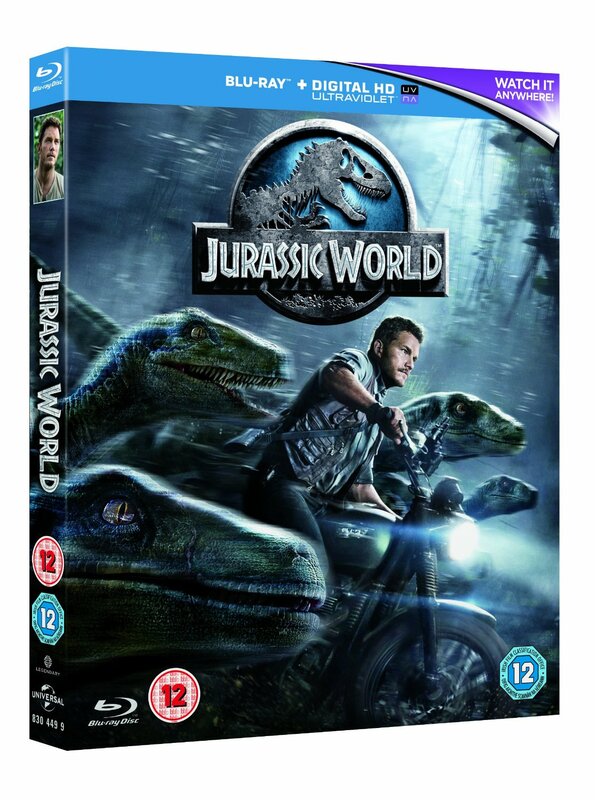 Jurassic World is a such a high profile release, that you’d expect the Blu-Ray to be brimming with special features…but it really isn’t. The film itself looks gorgeous on the format, and is just as entertaining upon repeat viewings. But with little to explore after the credits end, you can’t help but feel a little short changed. Clearly when it comes down to it, Universal Studios have failed to spare no expense.